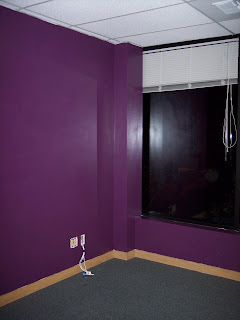 Mosquito and I painted my new office. 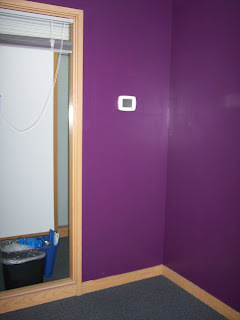 I knew I wanted to paint my office purple, but I was having a hard time deciding on the exact shade of purple I wanted. Then I realized that a gallon of paint was like $20! And I wasn't completely convinced that one gallon would do it. So, I went around to some of the Home Depots, starting last night with the one near my work, looking at their "Oops" paint selection. You know, the colors they got wrong for someone else's color selection and so sell for super cheap ($5/gallon $1/quart.) I didn't find any at the place last night and we had stuff to do, so we couldn't go around looking. This morning I went to the one near my house and didn't find a very good selection either. Then I decided to try a Home Depot that is in Bellevue, which is on my way from home to work. I would also see if Lowe's sold their mistake paint for cheap too. 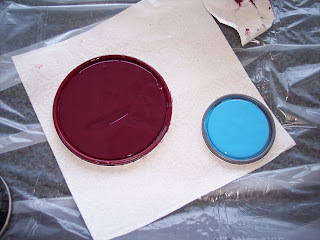 But, lo and behold, I found a gallon in a pretty shade of dark red and a quart in a horrible shade of bright blue that I thought would mix together well and figured for $6 it was worth a shot. They mixed together for the prettiest shade of purple. I'm not sure if the photos will do it justice. Plus, the completed ones are done at night, so the color won't look quite right anyway. At one point a guy came in to do some floor cleaning. 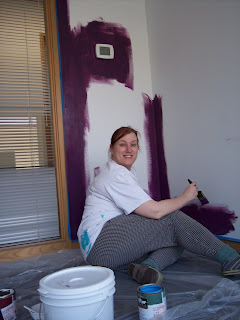 We were just starting and I only had some edging done on one wall. He said he liked the color. A co-worker came in when we were just starting the 2nd coat. 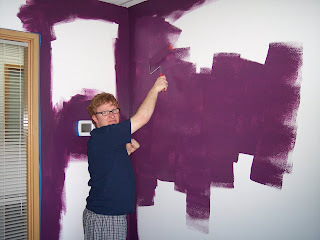 He really liked the color. He said it was the exact color from my fantasy PSP picture. I don't think it's quite that color, but it's equally as pretty.